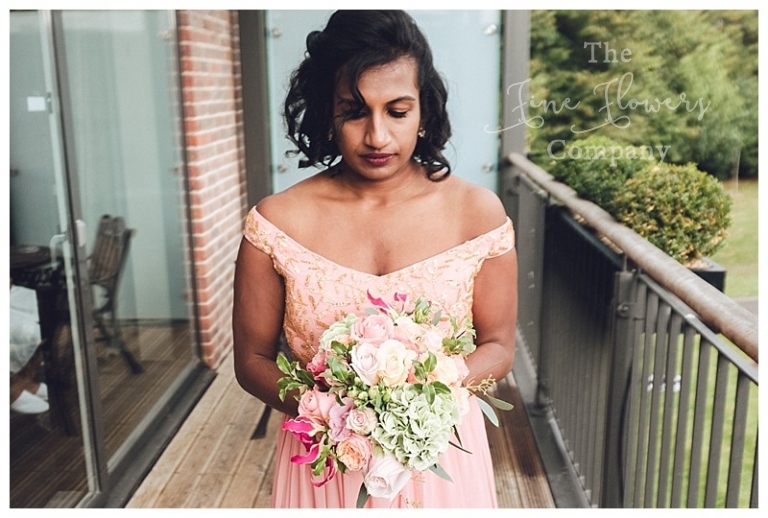 I was so excited when I met with Zyreeta and Vinoth to plan the flowers for their late summer wedding at Syon Park as I always enjoy the lovely vibe of the amazing domed conservatory, it’s like going to Kew Gardens but seeing the glasshouse as a bit of an insider. Zyreeta chose a beautiful pale peachy-coral as her wedding main colour scheme, and reflected this in the bridesmaids dresses and the wedding stationery. Together with the beautiful and natural glass-house setting for the wedding, this was a perfect place to set the seed for the wedding flowers decor too. 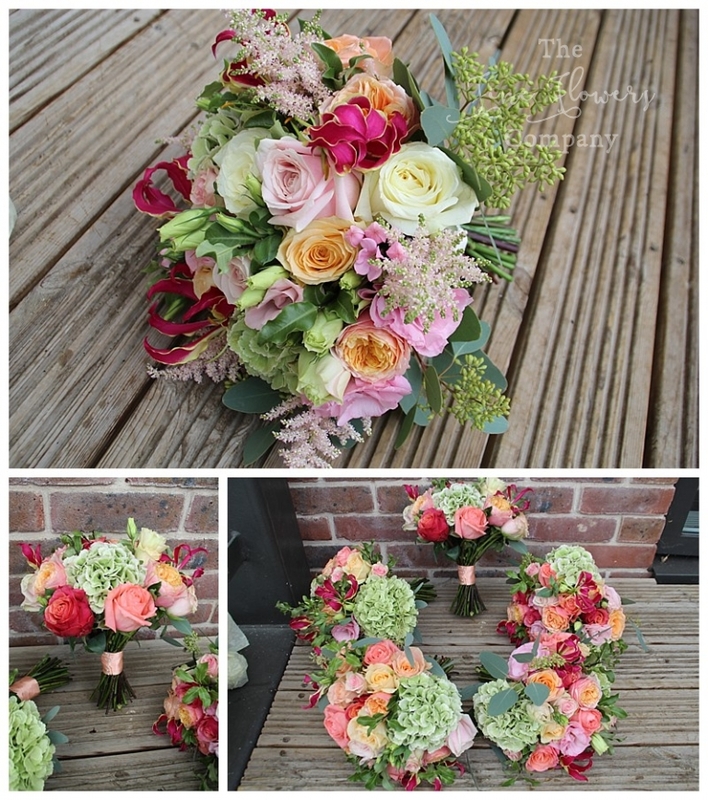 For her bouquet Zyreeta opted for a textural mixed bouquet of roses, bouvardia, blush astilbe, lisianthus and vibrant glorious lilies, with contrasting vintage green hydrangea and berried eucalyptus. 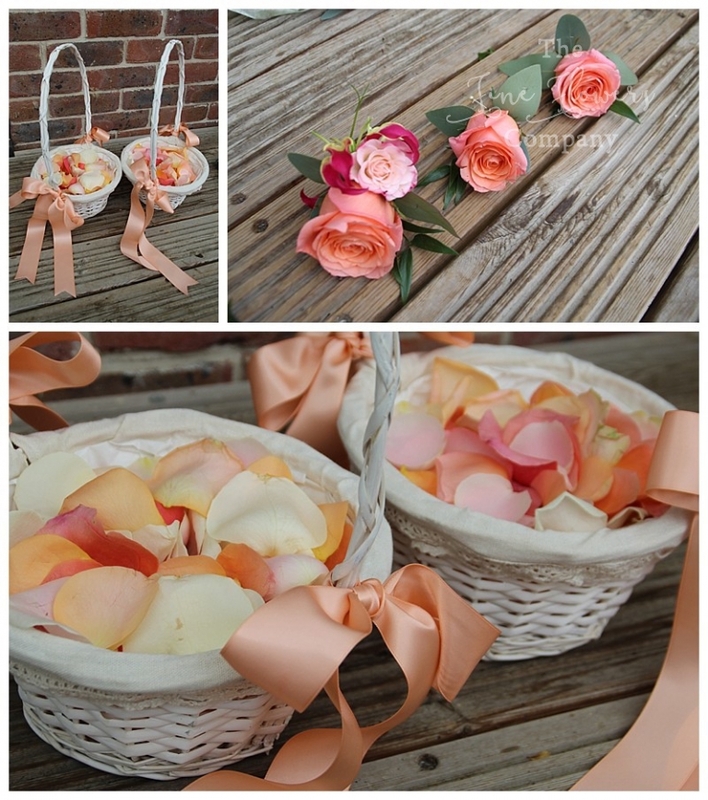 The bridesmaids had matching bouquets and the cute flower girls carried pretty ivory baskets with peach ribbons to match. The men all wore peachy coral rose buttonholes, and we added an exotic looking gloriosa lily to Vinoth’s buttonhole for a splash more colour to pick up on Zyreeta’s bouquet design. 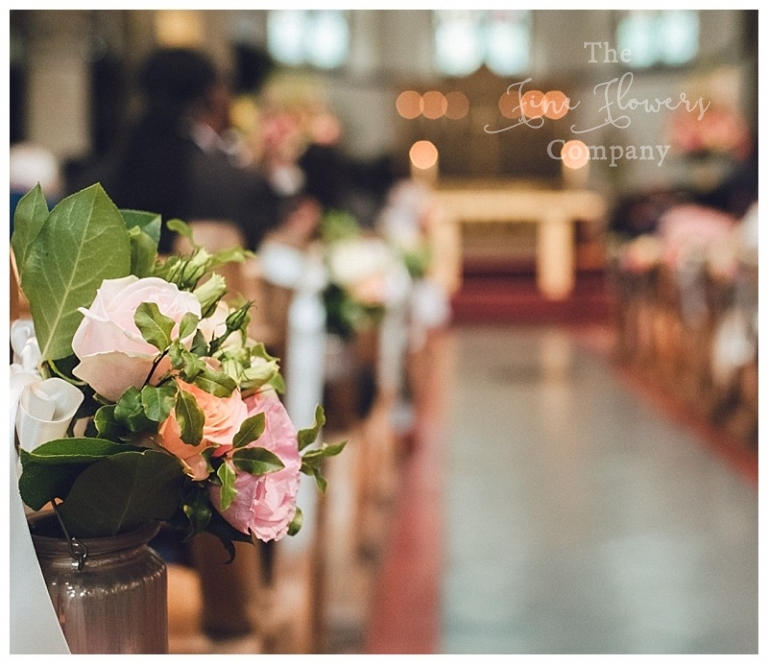 I thought the colour scheme for the flowers was a perfect fit: not only did this look gorgeous against the colourful outfits but also suited the venue so well. When you plan a wedding at Syon Park, you would sort of miss a trick a little bit if you make no nod to the hothouse feel of the great conservatory. This was just a good balance, not too tropical looking but with enough colour to feel at home with the setting! The wedding reception was held at the beautiful Syon House and Syon Park. Following a drinks reception and private photos in the main house, everyone arrived for the wedding breakfast in the stunning and dramatic conservatory glasshouse. Since the ceiling is so huge and the space so light and airy, the guest tables were dressed mainly with tall vase displays of colourful summer flowers, bursting with blush, pink and vintage green hydrangeas, astilbe, lisianthus and roses, contrasting with mixed apple been and dark green to link in with the foliage colour of the plants and trees in the conservatory. The remaining guest tables were dressed with vintage gold rose bowls of late summer blooms, and the top table was styled with a really lovely and long flower runner to match. The large urns brought over from St Paul’s were used to give a dramatic backdrop to the speeches, behind the top table. The favours were mini succulent plants in dainty pots which added a cute detail on the tables, and for the guest name settings we inscribed the names with metallic gold pen onto laurel leaves. The beautiful cake was provided by Jen’ Cakery and the lovely photography is thanks to Vincent Opoku Photography. Thank you so much to Zyreeta and Vinoth for sharing these with me!